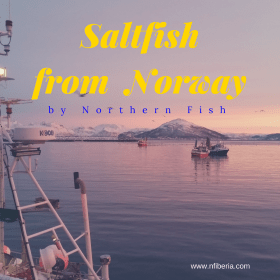 About Northern Fish – more than just codfish! Northern Fish is more than just another Portuguese codfish company. We are the saltfish specialists, at Northern Fish we make tradition delicious again! Producing several ethnic salted and dried fish products, making tasty traditional products for ethnic markets. Despite the medium size, Northern Fish is well supported by its own Norwegian salt fish production facilities. In Portugal since 2013, currently expanding operations, coordinating facilities with growing market requirements. Size and market strategy, have made us a very flexible and dynamic company. To satisfy customers needs and requirements is our utmost goal. Tailor-made salt fish solutions, based on a wide experience and knowledge of local traditions and cultures. We adequately offer specific salt fish products to several etnic markets. We are not just a codfish company, we are much more! Northern Fishs’ product assortment is based on salted Norwegian white fish. Salting is made from the finest fresh fish available. Our flagship product continues to be the traditional salted and dried codfish, but in addition haddock, tusk, saithe and ling are also available. In northern Norway, our processing plants acquire fish directly from coastal fishing vessels. Our long term relationship with fishermen insure the supply of the freshest Norwegian fish, arriving directly at our dock 24/7. Sourcing, splitting, salting and drying are our major daily activities at our Norwegian facilities, who work all year round to produce the finest best tasting fish. Norway is the key to our top quality products. Our plant in Portugal is an extension of our Norwegian operation, where personalyzed packing and sorting is made to meet each customers requirements. Northern Fish is more than just a common importer. Its tailor-made products require flexibility in drying and packing, which is handled with perso nalized attention. Product range includes codfish, colin, haddock, tusk and ling, as mentioned. The product range also includes a variety of other processed salted fish products like migas, loins and cutlets. Packaging can also be personalize to your requirements. Close to the best fishing areas, we strategically located our processing plants. Therefore the cold icy waters of northern Norway insure great quality to our codfish and to all our other salted fish. Due to our favorable location, we are able to offer very white flesh fish. Our organization is certified for sustainable seafood, our factory T-82 in northern Norway Skjervøy Fisk og Skalldyr AS, as of February 2015 holds valid MSC certificate for codfish, colin, tusk, haddock and a few other species. We support sustainable fishing. From the Atlantic Ocean all the way to the carton all products are controlled. Therefore making specific products that require know-how and flexibility is something we do on a regular basis. The control and surveillance of the production cycle, insures that batch after batch, quality standards are stable. Our goals. Sourcing the best wild fresh Norwegian whitefish, to produce a unique and traditional tasting salt fish. It’s 100% natural, just fresh quality fish and salt. Northern Fish products are recognized by consumers and customers as a high quality salt fish. We are extremely happy and grateful to the loyalty of our growing customer network.